The CESA Directory is published annually and contains the most comprehensive information on South African Consulting Engineers. 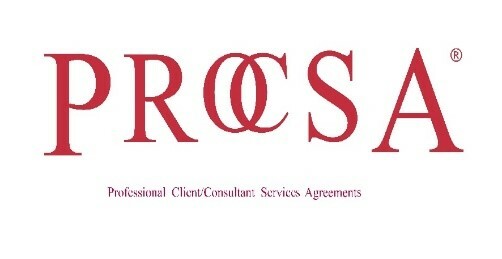 The CESA Directory of Firms provides an unmatched opportunity for your firm to promote its services in a focused manner to this group of professionals in the A+ income bracket. This publication enjoys the undisputed status of a reference document for consulting engineering capacity in South Africa. 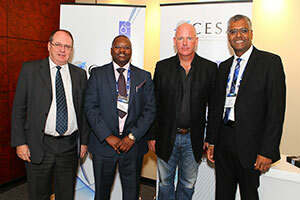 Consulting Engineers South Africa recently hosted a very successful conference at the Westin in Cape Town attended by over 200 delegates featuring 20 industry speakers. 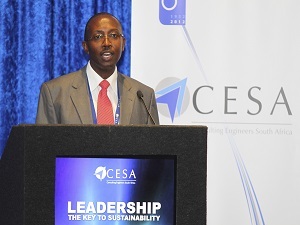 Lefadi Makibinyane, CESA CEO opened the conference by welcoming delegates and special guests that included keynote speaker, sustainability expert and author, Jason Drew and the Deputy Mayor of Cape Town, Alderman Ian Neilson. Makibinyane stated in his welcoming remarks that there were many challenges to Sustainability and that the National Development Plan was key to addressing these challenges that included the alleviation of poverty and inequality. He maintains that although the Public Infrastructure Coordinating Committee (PICC) is to be applauded much work still needs to be done to resolve the lack of capacity in the public sector. Procurement is another burning industry issue and he contends that quality should be the basis underpinning sustainable development. He believes that what is called for is visionary selfless leadership and hence the theme of the conference – ‘Leadership the Key to Sustainability’. 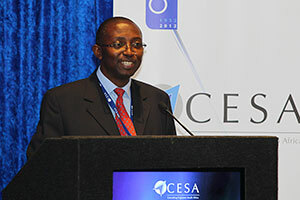 Consulting Engineers South Africa (CESA) is encouraged that the Medium Term Budget Policy Statement demonstrates government’s resolve to implement the National Development Plan (NDP). “We have been vocal about our support for the NDP as a roadmap and urged the government to provide the much required political leadership in ensuring the plan is implemented for the benefit of society and growth of our economy. We are pleased that the plan is taking its rightful centre stage and Government is assured of our backing in ensuring that the ideals and fundamentals of the plan are realised,” avers CESA CEO Lefadi Makibinyane. Consulting Engineers South Africa’s latest Bi-annual Economic and Capacity Survey (BECS) - January to June 2013 just released, indicates conditions in the first six months of 2013 were not as bad as expected, considering the better than expected increase in earnings, alongside a healthy increase in employment. 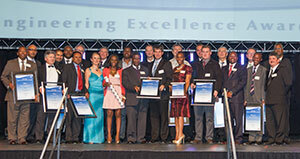 Consulting Engineers South Africa’s (CESA) prestigious CESA Aon Engineering Excellence Awards held at Vodacom World in Midrand on the 14th August this year is a celebration of innovation, quality, outstanding workmanship and professionalism in the industry. CESA is proud to host this annual event, sponsored by Aon South Africa, as a platform to showcase the important role that infrastructure plays in the sustainable development of our country. The Awards focus on consulting engineers and their clients who participate in or initiate projects that promote the advancement of our nation and the people of the continent.